How to find FUE Hair Transplant in Pakistan? How to perform Correction of fue hair transplant surgery by Dr M Jawad Chaudhry in Gujrat Pakistan? This patient had one FUE hair surgery session of 4000 grafts from some other low cost FUE Hair clinic. Dr M Jawad Chaudhry was honored with award from hair restoration society of Pakistan. Dr M Jawad Chaudhry,a hair transplant surgeon in Pakistan stood first position in American Board of Hair Restoration Exam.There were around 25 candidates around the world and he secured highest marks in oral component. To honor him,hair restoration society of Pakistan gave him the award in 4th annual meeting of HRSP in Islamabad 2019. There are around 18 American board certified hair transplant surgeons in Pakistan and always choose the certified doctor for your fue hair surgery procedure. what is depleted donor area or FUE over harvesting means?and when it happen? 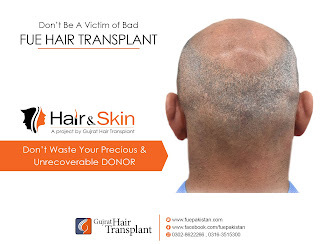 Your donor is very precious and don't just waste it for the sake of few rupees.Always choose the fue hair clinic with expertise and where doctor himself performs the extraction of fue grafts with right punch size. FUE is being performed by non technical and untrained staff with bigger punch size ending up in depleted donor area.Once your donor is depleted ,you wont be able to recover it. Its very precious area and one must take care of it by choosing the best fue clinic for the right job. Always ask the size of a punch in FUE surgery and never go beyond the safe extracting grafts limit range in FUE surgery.